The pedestrian walkways of North Calcutta (now Kolkata), is embellished with animal sculptures. As we are able to replicate the natural world in a synthetic medium, it becomes important to question the mode that led to the existence of the animal sculptures in the city. 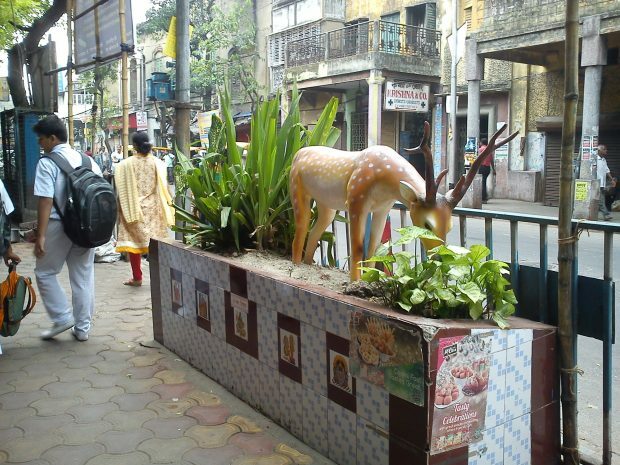 The fibre glass deer at Abhedananda road is installed on the pedestrian walk and is my subject for this enquiry. While one can relate the animal statue to biophilia or the love for nature, I contest that in my chosen case, it is rather a representative of economic convenience and aesthetic utility. I argue that focusing on living environment can contribute to economy, health and well-being to create a win-win situation. North Calcutta is densely built, highly populated and holds the oldest structures in the city. The city is facing the same challenge as any timeworn part of a growing metropolis –to keep up with the growing demands of the era. In particular, the city’s stagnant economy has long been a concern. However, recent uplift in the metropolis shows promise of revival on both fronts. The city has planned an investment of 650 crores (1,53,900 USD) into the Green City Mission. Planters and sculptures can not only add to beautification of the city, but also provide work to local industries and benefits nurseries. While the plants in the deer installation (see figure above) can cost between Rs 50 to 200 (1 to 3 USD) each, the fibre glass (or fibre reinforced plastic) deer can cost anywhere between Rs 10000 and Rs 30000 (150 to 450 USD). This contrast between the living and manufactured components of the deer sculpture surrounded by plants is thus not a representation of love for nature, but a symbol of economic stimulation of industries as opposed to nurseries; albeit through the lens of beautification. Green infrastructure plays a critical role in performing environmental clean-up functions. But as in the case of Abhedananda road, lack of space and resources pose a challenge to incorporating greenery. UC Berkeley professor Jennifer Wolch’s approach of ‘just green enough’ – which recommends smaller green patches as retrofits in the neighbourhood rather than full-fledged infrastructure like parks and lakes – can then be helpful to deal with pressures of resource optimisation and scarcity of land. But, sparse greening around the deer sculpture is not sufficient to absorb high levels of pollution emitted by a growing traffic in the city. Nevertheless, the green plants serve as a rest for the eyes. Thus, I understand that the importance of Wolch’s just green enough approach can be its firm roots in pragmatism. …in 1996, Jennifer Wolch speculated that with time, people will invite nature back into the cities. Today, two decades later, manufactured sculptures as a substitution have challenged that vision. Here ‘convenience’ can be seen as an extreme outcome of relying on pragmatism –and it does not seem to favour nature. One might also argue that the ‘deer’ symbolises our desire to be with nature. However, its artificial state also reflects our capabilities of settling for convenience. The deer sculpture is a convenient alternative to a living deer in many ways. It is easy to maintain, saves space, considers health and safety of citizens, does not demand a share of the scarce water supply, and not to mention, saves the ornamental landscape from the plight of grazing. The city becomes green and beautiful with this work of art. As opposed to the sculpture, a living deer would have required resources like: space for habitat; food and water. The utilitarian value of the deer as sculpture can thus be seen to be higher than a living deer in this situation. In the book ‘Zoopolis’ in 1996, Jennifer Wolch speculated that with time, people will invite nature back into the cities. Today, two decades later, manufactured sculptures as a substitution have challenged that vision. Here ‘convenience’ can be seen as an extreme outcome of relying on pragmatism –and it does not seem to favour nature. The production of the animal sculptures represents economic utility as a convenient alternative to the desire for re-naturing the city of Calcutta. 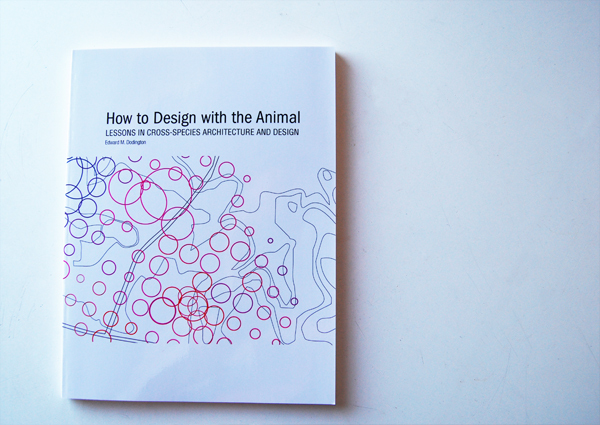 A densely packed urban fabric bears limitations to manage living macrofauna such as a deer. However, there maybe other animals that are able to adapt to dense urban conditions – and can be desirable alternatives to a plastic deer. A local biodiversity action plan is one instrument that can help accommodate and conserve suitable species within urban areas. But the real lesson is that cities need to focus on nature in itself as conservation of nature cannot be automatically guaranteed with focus on economy. Focusing on the living environment can have economic benefits as well. For instance, if focused on a real deer as opposed to an artificial deer – an alternative economy can be created. While on one hand, perhaps those associated with installation of the artificial deer may lose out, professional services to aspects like ensuring health and safety of the animal, habitat and conflict management –would certainly increase jobs in knowledge economy as well as other productive enterprises. A city can be economically stimulated through focusing on nature, thus driving to a more sustainable future. Amartya Deb is author of book Introducing Wildlife in Urban Areas. Deb considers environmental justice and sustainable development as matters of the heart.